A standout piece at London’s 2014 edition of 1:54 Contemporary African Art Fair, ‘Missing’ was the work of Nigerian artist Peju Alatise and is her response to the kidnapping of 234 girls from Chibok in Nigeria. 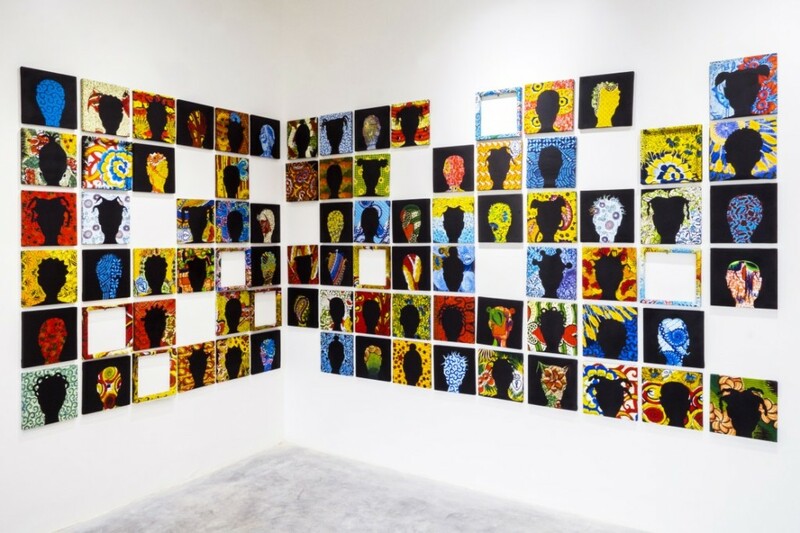 The tragedy and its subsequent controversial handling has been the subject of debate worldwide and Alatise’s pertinent work explores their disappearance, through a series of panels made from traditional Nigerian-print fabric and featuring silhouettes of the heads of anonymous girls, with some panels themselves missing. ‘Missing’ does not shy away from criticising the failings of the Nigerian government with each panel signifying a different girl that has been abducted, Alatise explains: “Missing is the representation of each girl that the government hasn’t done anything about finding […] or bringing them back home”. Although Alatise has experimented with many different media throughout her career, she frequently returns to fabric, as in this piece. The prints are elaborate mixtures of symbols and motifs that differ from one ethnic group to another, and in assembling them in collages Alatise endeavours to create ‘a new visual language’. Alatise was born in 1975 in Nigeria and later trained as an architect, which she credits with introducing her to the importance of materials, but she was always drawn to art. She is fascinated by the work of artists as diverse as Do-ho Suh, Antony Gormley and Piet Mondrian. Alatise defines her artistic practice as a search for truth and to this end much of her work centres on women in Nigeria and on the political and religious issues at the heart of the country. Your work at 1:54 this year was extremely striking, is this your first year at the fair? Yes, this is my first showing at the 1:54. What was your general impression of the fair as a platform for contemporary African artists in London? I had attended the first edition of 1:54 and this second edition I must say showed improvement, dedication and commitment to make this art fair relevant. The 1:54 art fair allows art from Africa to express itself on its own terms, giving its own definition whilst being unburdened by a predefined narrative. The one sided Eurocentric narrative that defines and ascribes its notions of what art from Africa should be. The notion that art from Africa cannot utilize modern materials and forms of expression and should instead be characterized by the use of traditional and generic materials from the local environment. A platform that creates a discourse between the artist and the general public in London who really want to engage with works and artists from Africa. On a personal note, the exhibition was an opportunity for me to engage with people on a deeper level with my work, to convey my concepts and critiques which reflect my deep social convictions about the continent of Africa in general and my home country, Nigeria, specifically. It was quite a revelation to witness people’s reactions to my work.